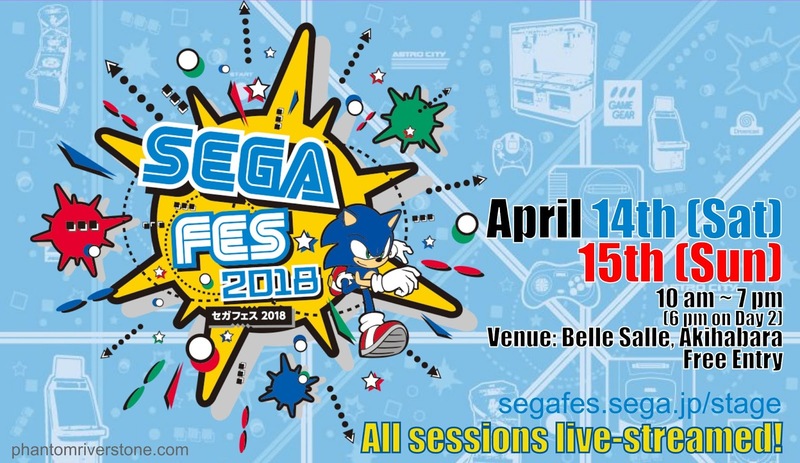 SEGA will be holding a festival event, "SEGA Fes 2018", this weekend on April 14th and 15th at the Belle Salle Akihabara building in Tokyo. This is SEGA's second such event, with the first one having been held in November 2016. This year's event also promises to be packed full of exciting presentations and entertainment. Furthermore, there will be live-streaming of all the events on YouTube and elsewhere. Stage events (B1 level): promising special guests, the latest information on recent games, "surprise announcements", gameplay competitions, and more! Giant Attractions (1F level): there will be a huge UFO Catcher (crane game) using a person to grab the prize instead of a crane; a giant Mega Drive (Genesis) controller for playing retro games like Puyo Puyo; the classic Sega arcade games Virtua Fighter II and Daytona USA; and some of the latest arcade games including a darts machine DartsLive3, and a driving simulator called SLDS-3G. 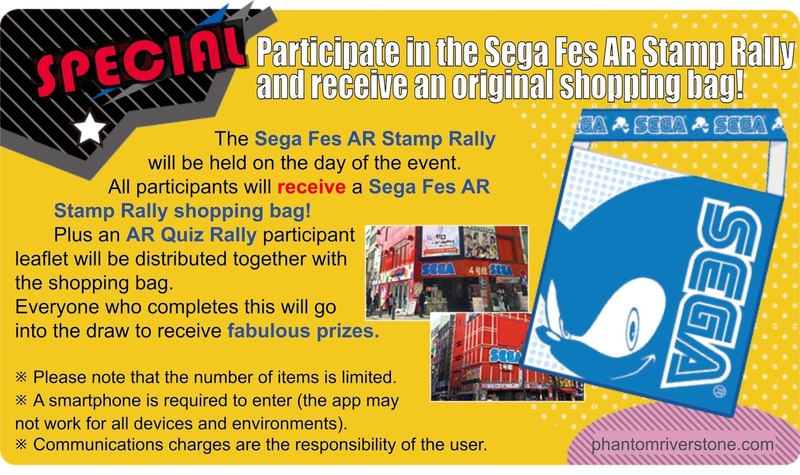 Taking part in an AR Stamp Rally (use an Augmented Reality app to collect stamps at the venue and around Akihabara). 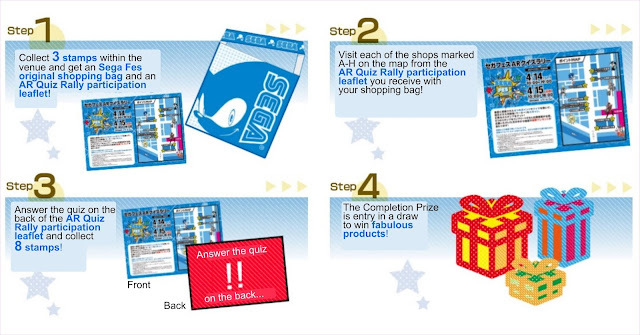 A merchandise area (1F level) for buying SEGA trinkets and toys. I have translated the full schedule into English below. (All times are in JST). 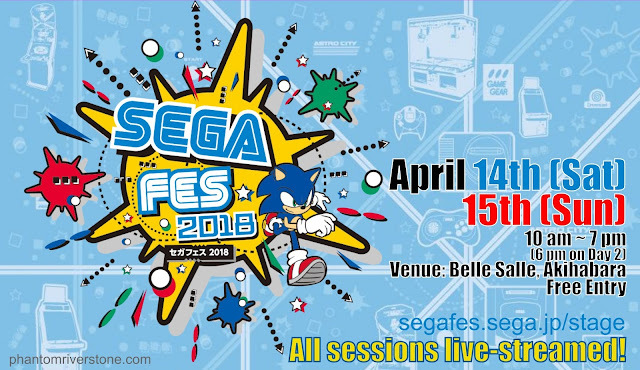 For sessions marked as Numbered tickets: SEGA staff will be distributing tickets for all such sessions from 7 am at street level on the central road side of the building (within the venue grounds). Don't wait until the time of each session to pick these up! The staff will ask you which session you plan to attend. All streaming links including YouTube and Twitch can be found at the top of the Japanese schedule page. 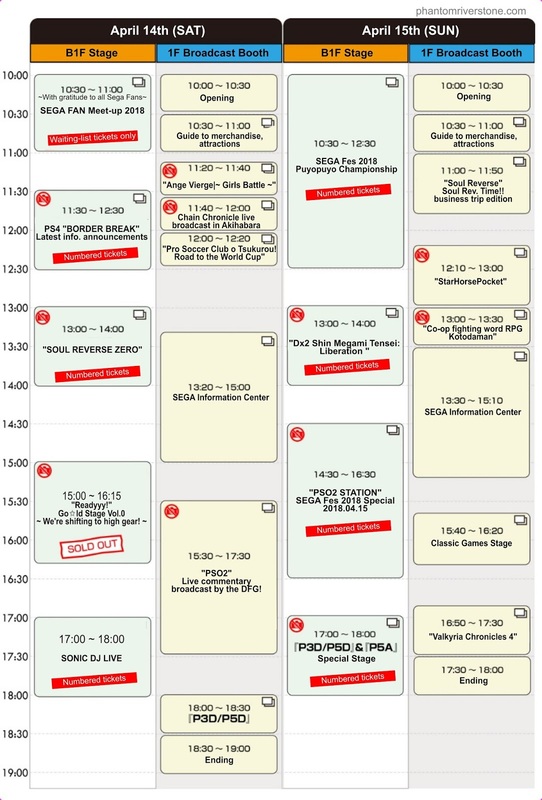 YouTube (stage events & broadcast booth): note that there are separate links for the various sessions and times. April 14th | Stage | 15:00 JST | "Readyyy! Go✩ld Stage Vol.0": this session is about a new project called "Readyyy!" that SEGA is working on which involves raising a group of idol singers. While seemingly not at all Shenmue related, the MC of the event is Masaya Matsukaze, the Japanese actor for Ryo Hazuki. April 15th | Broadcast Booth | 13:00 JST | "Co-op Fighting Word RPG Kotodaman": this soon-to-be-released mobile game has a cameo by Ryo Hazuki. We have covered it previously on this blog. April 15th | Broadcast Booth | 15:40 JST | Classic Games Stage: it will be interesting to see what games are covered in this session. 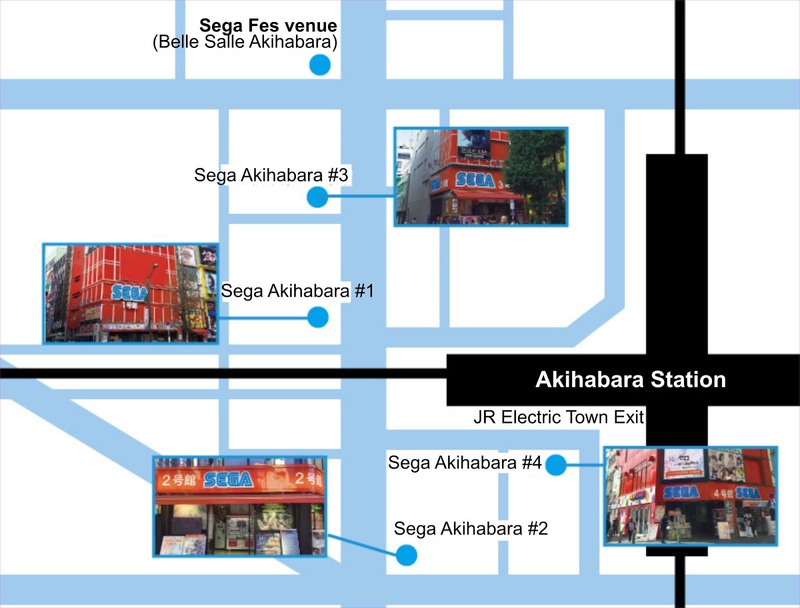 How times have changed since all those years ago when Shenmue was about to be released in Japan, and SEGA held a stamp rally in the Tokyo subway, using physical notebooks and stamps. Now the stamps are virtual, and an augmented reality app is used to collect them! To participate in these rallies, participants must download the AR app beforehand (Japan Google Play download link). Then follow the instructions below to gather virtual stamps and go into the draw for prizes including a Nintendo Switch and a Sony PS4. If you have completed the AR Stamp Rally then after leaving the venue show your SEGA shopping bag at each of the SEGA buildings in Akihabara to receive a SEGA Fes badge (a different color per building). Each building has a different-color badge. There is no Shenmue T-shirt to be found in the merchandise line-up, but you will be able to try your luck at drawing the Shenmue badge in the capsule toy machines, as seen previously at the Tokyo Game Shows in 2015 and 2016. 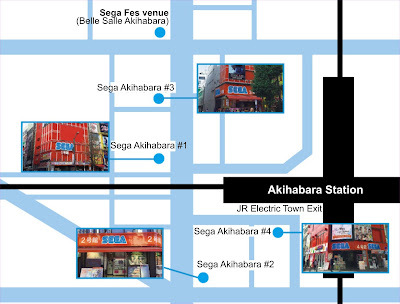 (Specifically, the design shown for SEGA Fes below is the 2015 version which has a Dreamcast logo at the bottom, while the 2016 TGS version has a SEGA logo). The badge line-up for SEGA Fes 2018. (The final badge is a "mystery" design). 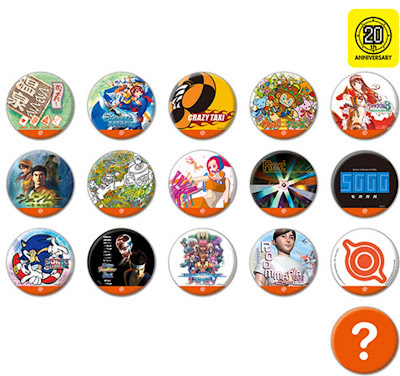 The Shenmue badge design is the one seen previously at TGS 2015. We Shenmue fans will be used to tempering our expectations when it comes to events, so I won't speculate in advance on whether there may be something Shenmue-related as part of the "surprise announcements" or elsewhere. However I do plan to attend this weekend, so watch for an update on the blog following the event.